Here you will find favorite photos I’ve taken here and there that may not fit into a particular blog post but which I want to share. 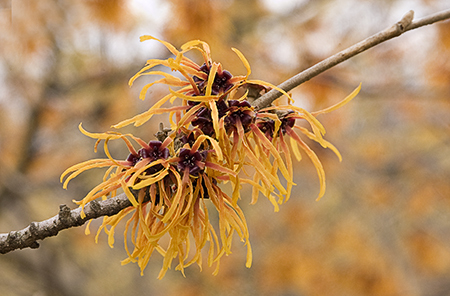 First, here is a winter photo which I’m entering in this month’s Gardening Gone Wild blog photo contest. Taken at the National Arboretum last winter, it caught my eye because of the contrast between the fluffy flower heads of the winter grasses and the brilliant red winterberry shrub behind them. A great combination for both designer and photographer! 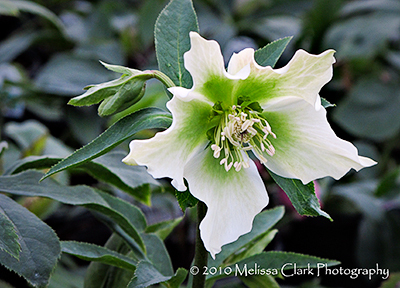 Today I took a road trip with some colleagues at my company, to visit a new (to us) wholesale plant supplier in central PA. A post will probably follow sooner or later, but in the meantime here is a hellebore photograph I couldn’t wait to share. Thanks to Terry for the great tour! Last year I spent months photographing a client’s very large garden for a photo book. It’s a beautiful garden with a brook running through it and almost every kind of tree, shrub and perennial imaginable. 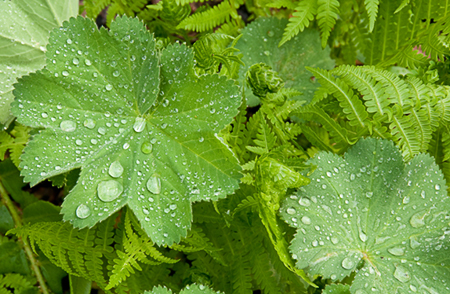 But one of my absolutely favorite photographs turned out to be this shot, of Lady’s mantle and ferns. It’s in a post called “Worth Quoting,” but here it is again as my entry for GGW’s contest this month. Skipped last month’s Gardening Gone wild photo contest but here’s my entry for June’s challenge to post your “best frame ever.” The truth is, I was hard pressed to pick one, because I can always find something I would improve about any image I’ve taken. 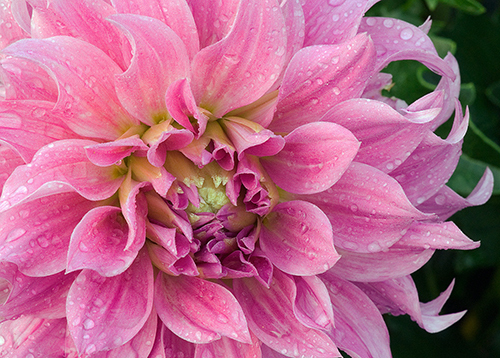 But here is a photo I took a couple of years ago of a lavender dahlia, at dawn with dew still on it, at a county “dahlia trial garden” out in the middle of nowhere. It made me fall in love with these flowers and is still one of my favorites. This month’s Gardening Gone Wild photo contest has as its theme “On the Road Again” – gardens glimpsed, unexpectedly, while away from home. Here’s my entry, which was originally part of a post entitled “Less Becomes More.” The image is called “34 Meeting Street.” It’s a garden half-glimpsed, half-imagined while in Charleston’s Battery Park area last spring, just as a dogwood was leafing out above a high wall. That is a great combination of plants. I keep seeing these gorgeous dried grasses in winter vignettes. The berries, though, make the shot. I’ll bet the birds love your place, with all those seeds and berries to eat. Just as our eyes love the beauty you have spread for us. Gorgeous colors from cream to red to the turquoise blue background. Good luck in the contest. I love the texture and contrast. Beautiful shot! Thanks to everyone for the positive feedback. As I recently said to a friend, I’d rather photograph gardens than design them – and I love doing both! A gorgeous shot…the contrasting shades and textures are beautifully composed and very eye appealing! 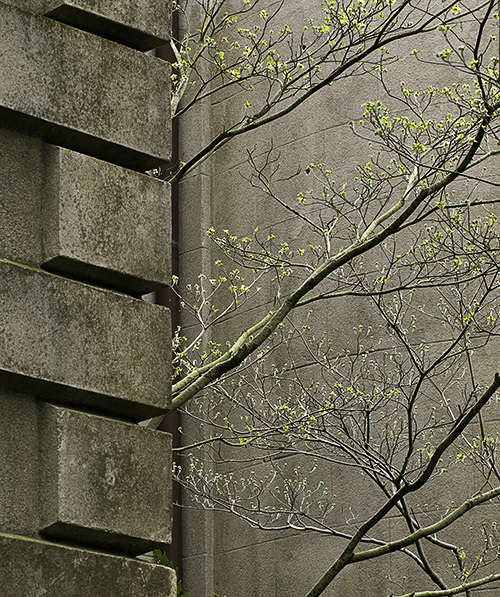 Very nice contrast of colour and texture, and I like the horizontal crop. Lovely photo. Great contrasts. I’ve been wanting a winterberry for my bird friends. Thanks for your very kind words. I checked out your blog and enjoyed the photos. Hope you’ll visit here often. Glad you like it. Actually, the water on the plants are really dewdrops (lol)- it was incredibly early in the morning at a client’s house that I was shooting for a book, and I was so loaded down with camera gear I couldn’t have carried a mister if I’ve wanted to! That dogwood shot makes me want to walk around the corner and see what else is behind there. Nice. Thanks. I would have loved to, myself, were it not for the fact that the entire garden is enclosed by very high walls with no way to see through to anything unless you are invited it – unlike other Charleston gardens, like the one in your post taken in Sevilla, where you can at least get a glimpse. I love your Chihuly shot! I really like your August GGW entry. The spring green of the baby leaves contrasting with the brown-gray stones, the angular branches, the geometric pattern of the stone wall: picture perfect! Good luck in the contest. Caroline, I’m especialy flattered by your comment since yours is the one that most quickly caught my eye among the entries. I think this is one of the most interesting themes GGW has chosen for a photo contest. Best of luck to you! John, thanks for the kind words. High praise coming from you. Sorry I will miss you at the NBCC outing tomorrow! Beautiful composition. I love the lines created, juxtaposed… a fine piece! Thanks so much! I see you are another PC winner from earlier in the summer. Congratulations to you too.